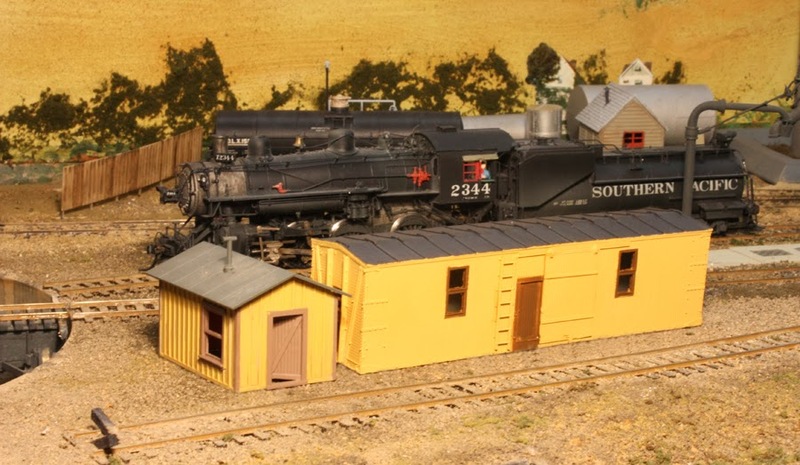 Some time back, I posted a short description of some of Southern Pacific’s caboose servicing procedures and arrangements, which can be seen at: http://modelingthesp.blogspot.com/2011/01/modeling-caboose-servicing.html . I needed to create a building as part of the engine terminal in my layout town of Shumala, where there is a caboose track. I’ve described my overall concept and plans for this engine terminal in another post (at: http://modelingthesp.blogspot.com/2011/04/modeling-engine-terminal.html ). After looking through various Southern Pacific books in which caboose facilities could be seen, and particularly on the caboose track at San Luis Obispo, I decided to use a box car body. Of course a box car is not a very good working space, at a minimum requiring windows and more convenient doors. Then it hit me: box cars converted by SP in just that way were used as interim cabooses, and there are several fine Westerfield kits for different versions of these cabooses. I decided to go with one of those, and chose kit 10302, the body with double windows. Here is how the one-piece body looks. I did insert a floor of 0.060-inch styrene to keep the sides straight. Photos I have seen from around the SP, of box car bodies used as various kinds of sheds, often show hand brake, grab irons, ladders and running boards stripped off. That seemed like a simple way to go, so I simply added one side ladder to the Westerfield one-piece body. 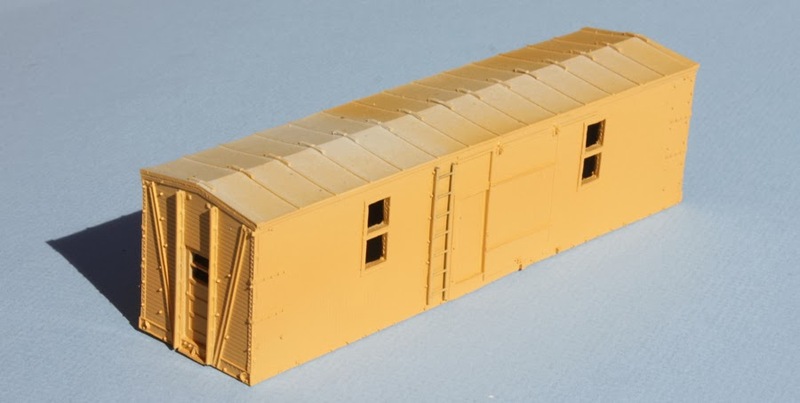 Caboose service buildings like this were usually painted in the depot scheme, with Colonial Yellow walls and Light Brown trim. I airbrushed my car body with Tru-Color’s paint no. TCP-153, Colonial Yellow, so it looked like this. The next step was to mask windows and doors, and airbrush them with Tru-Color no. TCP-163, Depot Trim Brown, which is the Tru-Color name for the color that SP called Light Brown. I then painted the roof a kind of “weathered black” color, having seen a couple of SP structures like this which appeared to have had a coating of roof cement slathered onto their roofs. This tarry material was not applied with any finesse (I have a photo of it being applied with a string mop on a caboose roof), so brush painting is not only okay here, it is probably preferable. Here is the structure so far, certainly needing a bunch of weathering but otherwise pretty much the way it is intended to be. In place alongside my caboose track at Shumala, it lacks trackside detail, which I will add, as well as the weathering already mentioned. Of course in normal use, the building will not be very visible, because there will be one or more cabooses on the track in front of it. 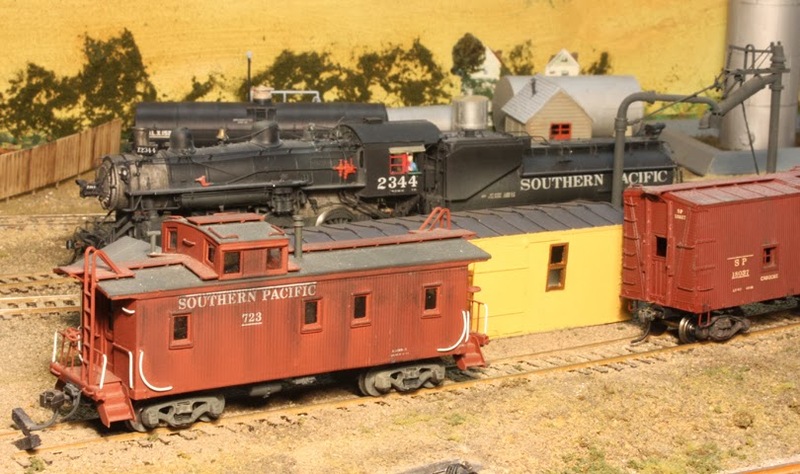 It might look something like this, with the farther caboose being one of the boxcar “temporary” cabooses which SP used, also built from a Westerfield kit. My engine terminal is coming together. Next project is the sand house, and some trackside detail for the shop track and the RIP track area. Great info as usual, Tony. I note that the C-30-1 caboose in the picture has the side-facing part of the L-shaped inner handrail on the veranda painted white. Looking at other pictures of your caboose fleet (at least one other C-30-1, and a C-40-3), the whole of this handrail is boxcar red. I assume that these variations are intentional, and I'd be grateful for your comments. Yes, intentional. I am not at home till Monday night so can't check pos right now, but my recollection is that shop practice varied on the color of that handrail. Sorry for "pos" above. Obviously clicked Reply too soon. I meant "photos." Further info, after examining the caboose book (Vol. 2 of my series, _Southern Pacific Freight Cars_): the earliest cars to have white handrails had only the end-sill post white. Later the curved side handrail was added, then some cars got the L-shaped handrail on the car end painted white, sometimes only the vertical leg, sometimes both legs. Overlapping photo dates for these variations suggest shop-to-shop differences. I may decide to do a separate post on this point.